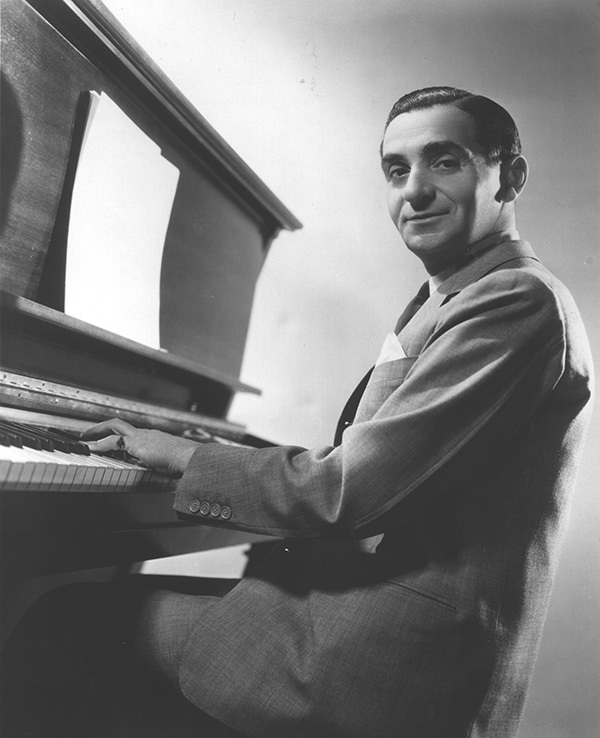 Irving Berlin had no musical training, to say the least, but that didn’t mean he didn’t have musical technique or musical craftsmanship.Berlin came to songwriting through his keen ear for popular song, first a lyricist who could craft an idea or sentiment into something that fit within the 32-bar, verse/chorus pattern of the day. His musical development was also instinctive; early in his career, he could plunk out “a simple melody” on the piano, within the key of F-sharp. His playing on the keys mattered less than the melody he heard in his head. As his career progressed, he used a transposing piano, which mechanically changed the placement of the keys (he called it his “Buick”) and allowed him to hear the melody in other keys. He also employed a series of musical secretaries and arrangers, to whom he would dictate his melodies, so they might work out the technical arrangements. One of them, composer Harry Ruby, said, “When I’d play back to him what he dictated, he’d listen [and correct me on the harmonic chords]. He’d be right - he couldn’t play the chord, but he could hear it all right!” Still, left to his own devices, Berlin frequently struggled to get his melodies exactly right: “A simple melody will always linger- I mean the kind you pick out with one finger,” he wrote in one lyric. With the possible exception of George Gershwin or Johnny Mercer, no major songwriter of the 20th Century performed his own work in public as often and as successfully as Berlin. Although, as his friend Kitty Carlisle Hart once said, he had a voice “so thin, only a dog could hear it,” Berlin sang his work from his days as a song plugger in the early 1910s, through his two stage appearances in Yip, Yip, Yaphank and This Is the Army, on the radio with Frank Sinatra, all the way up to a 1968 television appearance on The Ed Sullivan Show. In addition, he was an eager pianist at various public functions - in fact, “Alexander’s Ragtime Band” made its debut when Berlin tried it out at a 1911 Friar’s Frolics event. Only an individual with significant musical talent would be comfortable displaying his showmanship in those venues. Berlin’s gift for lyrics would be astonishing even for someone whose first language was English. Perhaps this cultural dislocation allowed Berlin both to see the intricacies of the English language and to render it in such deceptively simple ways. Early on, he had a unique ability to “deconstruct” words for impressive effect: in “I Love a Piano,” the lyric runs: “You can keep your fiddle and your bow / Give me a p-i-a-n-o--oh, oh!” Even the title of “I’ll See You in C-U-B-A” reveals a writer who knows his way around a homophone. Berlin was not a manipulator of word play for its own sake, however; a Berlin trademark is a lyric that flips itself around at the last minute to reveal a deeper meaning, a kind of whole that is greater than the sum of its parts. In the film Top Hat, he provides two brilliant examples: “I’m fancy free and free for anything fancy” and “The clouds broke / And, oh, what a break for me." The relative simplicity of his songs - in the case of “All Alone” or “God Bless America”, the lyrics are only a sentence or two long - belies the effort that Berlin put into creating them. His gift was to create songs that sounded like honest and sincere expressions of emotion from average folks. Often toiling through the “wee small hours” to create his best work, Berlin weighed the relative value of a word or a chord with the meticulous care of a chemist. Some songs could take days to get right (especially the bridge, or middle eight, which he felt was essential to a song’s success); at the same time, he was capable of churning out masterpieces in a fell swoop. Apparently, after reading a draft of the script for Annie Get Your Gun, he wrote a handful of first-rate songs over the weekend. In any event, he was a dedicated craftsman who took his work seriously - unlike other songwriters, he was not one to jot down a lyric on the back of an envelope in a cab ride or improvise quickly at the piano at a cocktail party. Berlin was second-to-none in his skill at writing self-contained musical numbers for the manifold revues that sprouted up on Broadway (and Hollywood) during the first part of his career. He professed himself averse to what he called “situation shows” - the heavily narrative driven musicals post-Oklahoma! - but the fact is he was writing, if not to specific situations, then to specific contexts since 1915. The Cocoanuts, Face the Music, and Louisiana Purchase all predate Oklahoma! and Berlin provided admirable scores that advance the story for those shows. He demonstrated that he was capable of mastering the evolved form with Annie Get Your Gun and went on to write three more narrative shows. Fred Astaire began his long personal and professional relationship with Berlin on Top Hat in 1935 and continued for five more films. Berlin’s songs were essential to Astaire’s identity - “Top Hat, White Tie, and Tails,” “Cheek to Cheek”, “Let Yourself Go,” “Let’s Face the Music and Dance,” “Change Partners,” “Steppin’ Out With My Baby,” among many more - and when Astaire recorded the seminal 4-LP set “The Astaire Story” for Mercury Records in 1952 (with Oscar Peterson’s jazz combo), Berlin’s tunes made up for one-quarter of the 40 tracks - more than any other composer. “You give Astaire a song and you could forget about it.” Berlin once said, completely trusting his favorite singer/dancer. Merman first appeared in a Berlin vehicle with the 1938 film Alexander’s Ragtime Band, where she sang half-a-dozen numbers. “I love to write songs for Ethel,” he once said. “It’s a little like a dress designer getting an extra kick when he dreams up a gown for a beautiful woman with a perfect figure.” He tailored his 1946 score to Annie Get Your Gun to her talents, as well as the 1950 stage show (and 1952 film) of Call Me Madam. Merman’s biggest screen appearance was as the lead in the Berlin anthology There’s No Business Like Show Business in 1954 - singing over a dozen numbers - and the last major song Berlin wrote for the stage was “An Old-Fashioned Wedding” for the 1966 revival of Annie Get Your Gun, expressly for Merman. To say that these three giants - Crosby, Astaire, and Merman - did not suffer fools gladly would be an understatement; the fact that they embraced Berlin personally and professionally for the bulk of their respective careers - and the fact that he supplied them with signature numbers many times over - attests to the musical genius of Irving Berlin. Written by Laurence Maslon - an arts professor at NYU’s Graduate Acting Program. He has written numerous books and documentaries about musical theater and edited Berlin’s As Thousands Cheer for the Library of America anthology American Musicals (1927-1969).